Enhanced Abilities: Attuma has superhuman strength, agility and endurance. Amphibious Physiology: Attuma is capable of breathing both on land and underwater. Body Armour: Attuma’s body tissues are considerably harder and more resistant to physical injury than those of a human being, Attuma can withstand great impact forces, falls from great heights, high calibre bullets, powerful energy blasts, exposure to extremes in temperature and pressures, and falls from great heights without sustaining physical injury. Enhanced Senses: Attuma is specifically adapted to living in the ocean. His eyes are capable of seeing with perfect clarity, even in the near-total darkness of the ocean floor. He is also able to hear and smell under the water as well as humans do on land. 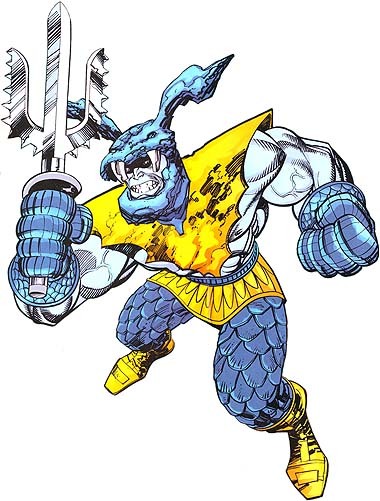 Attuma was born into the tribe of Homo Mermanus who eschewed civilization to live as underwater nomadic barbarians. By some unrecorded method, Attuma was endowed with strength far surpassing that of his people. Nearing adulthood, Attuma learned of a prophecy, in the lost Atlantean Chronicles, of a conqueror who would take the empire of Atlantis by force. Believing himself to be that conqueror, Attuma moved to a position of leadership over his barbaric brethren, and launched an attack on the city of Atlantis and its ruler, Prince Namor, also known as the Sub-Mariner.